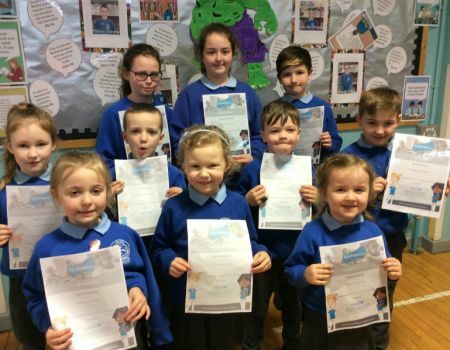 Welcome to the St. Paul’s Primary School, Irvinestown website. Thank you for taking the time to visit our new website and we hope that you are able to learn more about the life of our school community through your visit. As a Catholic school, St. Paul’s is wholeheartedly committed to the spiritual, moral, personal and social development of our children and the fostering of Christian values for life in an inclusive enriching environment. Our pastoral care is inspired by Christ the Good Shepherd and his faithful love for his flock. This love is made visible by the school’s approach to its caring role and permeates every aspect of school life. We are fully inclusive and we welcome children from all religions and cultures. For more information about St. Paul’s P.S. why not view our prospectus below or if you would like to visit the school, please do not hesitate to contact us directly on 028 68621133 or on our mobile 07802 881241.